A mere seven months after Roku dropped its updated Roku 3 media player sans 4K streaming, the company dropped the other shoe – the 4K-compatible Roku 4, which goes on pre-sale today for $129.99, available later this month. The Roku 4 is coming just in time to compete with three other new media streamers just hitting virtual retailers: the new non-4K Apple TV ($149.99, later this month) and Google Chromecast ($35, available now), and especially the new 4K Amazon Fire TV ($99.99, available now). Ironically, the Roku 4 will be Amazon Fire TV's only major media streamer sales competition on Amazon's own site next month; you might have heard that the giant online retailer would no longer be selling its Apple and Google competitors as of October 29. Rather than the slightly-larger hockey puck shape of previous Rokus, the new Roku 4 is more plate-shaped, so will sit a bit more stably atop your AV stack. Or, you can stick it behind your TV because the Roku 4 remote is RF – radio frequency – not infrared (IR), which means the box doesn't have to "see" the remote. There's also a remote finder for when you misplace it – just tap the button on the Roku 4 box and the remote will emit a customizable sound (like a Star Trek sound FX). And, as with the Roku 3, the Roku 4 remote includes a 3.5mm headphone jack for remote private listening. • HDMI 2.0 output, plus an alert in case your Roku 4 isn't connected to a 4K-compatible HDMI input jack on your UHD TV, also an exclusive-to-Roku nicety. This is NOT an HDMI 2.0a-compatible output, however, necessary for compliance with new High Dynamic Range (HDR) standards with which most new 4K content will be encoded and with which most new 4K TVs will be equipped. Roku is a non-denominational 4K content provider, so the company can claim it offers more 4K content than any other 4K streamer (i.e. Amazon Fire), including Netflix, M-Go, Toon Googles, Vudu, You Tube – and Amazon Prime. 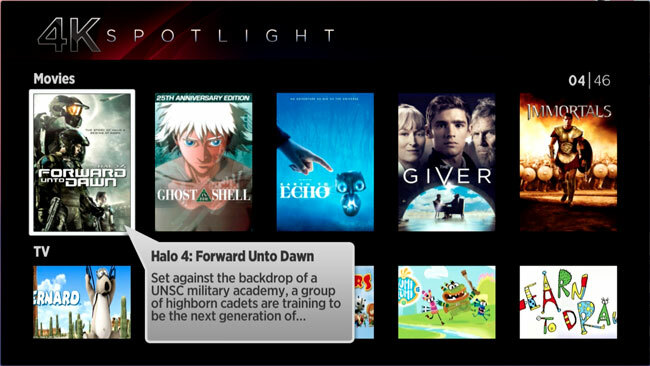 Roku 4 adds a 4K Spotlight channel that curates available 4K content and a 4K UHD category within the Roku Channel Store so you can easily see all the available 4K channels. Roku unveiled voice search with the Roku 3 last March, but wasn't the first to introduce voice search – Amazon, for one, beat Roku to the punch. But Roku's voice version is more egalitarian: since Roku doesn't sell content, it lists results from a list of 20 channels in order of how cheap the choice is, starting with free; Amazon search results emphasize its own Amazon Prime content source, free or otherwise (and usually otherwise). Roku also promises that they "get you to the content the fastest." Roku has expanded the unique Feed/Follow feature first found on the Roku 3: Roku lets you know when content you want to see (or Follow) becomes available for streaming. Previously, the Feed let you Follow only films; now you can Follow TV shows and/or specific episodes, actors and directors. And instead of making you sign into Roku and clicking on Feed in your TV's Roku interface to get an updated Follow list, you can check the updated Roku app to see if the show you want to see can now be streamed, as well as any price changes (such as if the show or film is now free). Roku's TV interface, version OS7, is presented in crystalline 1080p, nice for reading program descriptions, but even better for seeing your own photos that you can use to create a custom screensaver. The Roku's mobile iOS and Android apps also have been overhauled (v3.3.0) as of today or tomorrow. Now included in the app is voice search, Feed, remote control and Play on Roku, which lets you view content playing on your phone on your TV via the Roku box, similar to Apple Play. You can take your Roku with you on business trips, vacations or to college via the company's new Hotel and Dorm Connect interface feature. Just jack your Roku 4 into the hotel or public TV (assuming it has an HDMI input jack), then sign into your room's Wi-Fi network as you would with a smartphone, tablet or laptop, and start streaming your own Roku content. We'll have more on the comparative aspects of all of these media streamers after we get our hands on all of them later this month.